Hotels for business travel, offering wi-fi and high speed internet connections, business centers, meeting and conference rooms, voicemail, work desks, as well as many other amenities for today's business / corporate traveler. Find the perfect corporate hotels in Brussels by going directly to hotel websites. Check availability, amenities, and rates for business accommodations Brussels directly from each property. Located next to the World Trade Centre and the European Parliament, the Thon Hotel in Brussels city centre is also just a 10 minute walk from the famed Grand Place. The cultural heart of the city is just a stroll from this Brussels centre hotel. The Thon Hotel Brussels services the requirements of business and leisure travelers. The Spitsbergen bar is the perfect place to sample some Belgian beers, there is a large onsite restaurant, and the hotel’s top-floor relaxation centre has a fitness room, sun beds, sauna, and panoramic views. The hotel also has extensive business facilities, with 17 function rooms for a capacity of up to 400. The Thon Hotel Brussels offers non-smoking and disabled-access rooms, along with anti-allergenic floors. All rooms are equipped with air-conditioning, refrigerators, telephone with voicemail systems, internet access, and soundproofed windows. To find and reserve the perfect room at the Thon Hotel Brussels, why not look at our rates and availability? The Thon Hotel Brussels Airport is one of the best business hotels in Brussels, located in quiet surroundings close to Brussels National Airport and NATO headquarters. A complimentary weekday shuttle service runs to and from the airport. The hotel is easily accessible from the Brussels Ring road and is only 15 minutes from the city centre. 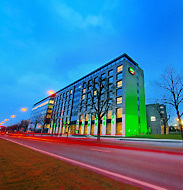 The Thon Hotel Brussels Airport is a smart, stylish venue with traditional comforts and up-to-date facilities. Leisure and business guests alike will find it well appointed. The Le Bistro restaurant serves a range of French and Belgian dishes, while the lively Portofino Bar is just the place to unwind with a drink on the terrace. Two serene, naturally lit meeting rooms are perfect for small business courses and events. The 100 comfortable rooms at the Thon Hotel Brussels Airport are equipped with TV, telephone, minibar, tea & coffee facilities, and a trouser press. To stay at one of the top business hotels in Brussels, check our rates and availability.